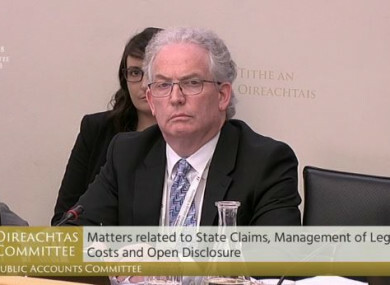 TONY O’BRIEN HAS criticised how TDs questioned him at the Public Accounts Committee (PAC) yesterday. O’Brien stepped down as the HSE’s Director General last night amid the controversy over a failure to communicate the findings of tests to women who were diagnosed with cervical cancer. In a heated exchange at the committee, Fianna Fáil TD Marc MacSharry said if such a controversy had taken place in the private sector, O’Brien would “be gone months ago”. This morning, without naming any particular individual, O’Brien tweeted about how people conduct themselves at committee meetings. Memos released to the committee showed that HSE management was warned in 2016 that there could be negative media coverage an audit into CervicalCheck, the national cervical cancer screening programme. MacSharry said his questioning at committees is always robust and that his “personal frustration and anger may have come across” yesterday as he had just listened to Emma Mhic Mhathúna speaking about her terminal cancer diagnosis on the radio. Emma, a mother of five children, yesterday gave a deeply emotional interview with RTÉ Radio 1′s Morning Ireland. Vicky said the tone of the tweet “smacks of someone who is used to getting his own way, throwing one’s toys out of the pram springs to mind”. She said O’Brien’s use of the word ‘hysteria’ at the committee yesterday “just sent me over the edge”. At the committee, O’Brien said “anyone who is found to have failed in their duty” will be held to account following due process and disciplinary procedures. He said the outcome of this process will be made public once it is complete. Email “'He's lashing out': Tony O'Brien criticises TDs' conduct at committee meeting ”. Feedback on “'He's lashing out': Tony O'Brien criticises TDs' conduct at committee meeting ”.